I don’t know about you but sometimes I can be strumming around on my ukulele and playing a few chords and I don’t know which chord to play next. I’ll try something but it might not sound quite right. When I first found out about the circle of fifths it seemed to solve this problem. I had a chart at my fingertips which helped me to find chords that just worked together. The only problem was, I didn’t always know how to play those chords so I’d have to look them up. It wasn’t the end of the world but it kind of killed the fluidity of my playing having to search for chord diagrams each time I encountered a chord I didn’t know. 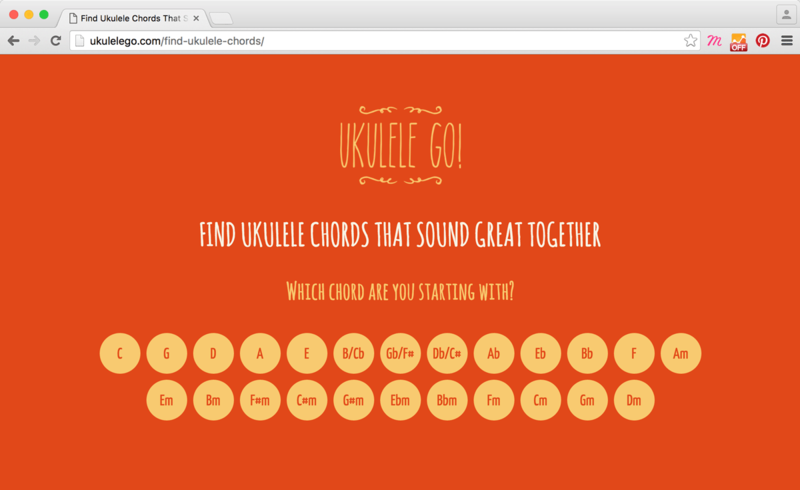 That’s why I built the Find Ukulele Chords tool. You simply pick your starting chord and it will give you 6 chords that sound great when played together. Obviously it’s just a starting point, you can always throw other chords into the mix but it should give you a good starting point and also introduce you to a few new chords. It should work pretty well on your mobile too, so if you’re nowhere near a computer when you’re playing you’re good to go. The fingerings have been included and this is something that I’ve thought about. Really I’ve used the fingerings for the chords the way I like to play them, don’t feel bound to my way though – however it works best for you is the best way to play them. I’m still making improvements and I’ve had some great suggestions so far, some of which I’ve already implemented and some that will be added pretty soon so if you have any ideas, let me know! This is a great starting place for people learning their keys! Kudos for putting this together. The internet is teaming with this information, but never in such a simple, concise format. A couple chord diagrams are a bit clunky (like Ab, extended barres for Bb – a playing preference, not a necessity,etc…), but otherwise I’m sure this will help many people dig into songwriting or simply chord relations! Hi Brad, thanks for commenting – you’re probably right. Personally I do tend to play full barres even when they’re not necessary – probably a force of habit from my guitar days! Thanks Jim, an app is a great idea – I’ll look into that. Did an app get developed since this 2016 post? Hi Joy, it didn’t I’m afraid – app development is beyond my skills. This is so helpful, thank you! I ran into the same problem: just knowing the name of the chord didn’t show me how to play the chord, and I don’t know enough theory (yet!) to figure out all the notes in each chord myself. We appreciate your taking the time to create this!